Fredericka Meek can bench press 4 pounds blindfolded and is fully prepped for the zombie apocalypse. A true multi-hyphenate, Fredericka recently performed in the pre-Broadway workshop of Car Wash the Musical: The Norman Whitfield Story where she played Bunny, Norman’s niece and a hopeless romantic. She toured the USA and Canada as one of two “Coquettes” performing with Conan O’Brien in his Legally Prohibited from Being Funny on Television Tour. 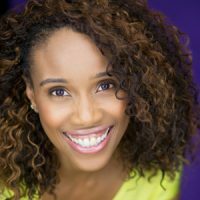 Fredericka also starred as “Destiny” in the critically acclaimed musical Love in All The Wrong Faces, produced by Laval Belle and directed by Taja V. Simpson. She recently was a featured vocalist in an HIV/AIDS Awareness benefit near to her heart – The Silence Is Broken, produced and directed by Patrick Gandy and starring Loretta Devine and T.C. Carson. Performing in such exotic locales as India, Chile, Hawaii and Japan, Fredericka has shared the stage vocally with such music legends as Stevie Wonder, Barry Manilow, Cheryl Lynn, Berry Gordy, Smokey Robinson, European pop star Bosson, Ollie Woodson (former Temptation), rock/metal sensation Marilyn Manson and R&B great Dave Hollister. TV & Film: Kid n Plays’ Funny Business, Dak Tandy, Willing and Able (pilots), Conan O’Brien’s Can’t Stop, F/X’s Anger Management, ABC’s Work It, TBS’s CONAN, TNT’s Franklin & Bash, NBC’s Tonight Show, Fox TV’s Head Cases, ABC’s General Hospital. Theatre: The Starmaker, Little Shop of Horrors, The Bubbly Black Girl Sheds Her Chameleon Skin, Body Language: The Musical, Sheba and Joseph and the Amazing Technicolor Dreamcoat. She is a founding member of the all female sketch comedy group Illuminaughty By Nature, currently making a name in the LA comedy scene with their unique flavor of sketch comedy and musical parodies. Fredericka has also performed standup comedy: The Comedy Store, Flappers Comedy Club, Haha Comedy Cafe and select L.A. street corners.